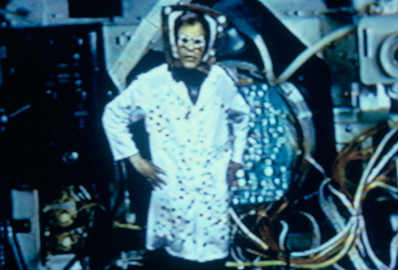 Taking its cue from the hobby horse and the Cabaret Voltaire, Re: PLAY references the video work of Jaime Davidovich as a whimsical challenge to the conventions of television and painting. Beginning with one of his earliest works Road (1972), the exhibition courses through to his latest Urban Landscape (2011) that melds technology with painting. The tension between painting and video, the emerging art form at the time, is visibly palpable. While not a retrospective, Re: PLAY re-examines key works in light of the artist’s preoccupation with space and subjectivity that transgresses the domain of each medium. According to Judith Escalona, Curator and Director of MediaNoche: "Davidovich uses one art form to push the boundaries of the other in a kind of dialogue or dance that can be argumentative at times." Jaime Davidovich is the recipient of three National Endowment for the Arts Visual Arts Fellowships, for the years 1978, 1984 and 1990; and two grant awards from the Creative Artists Public Service Program, New York State Council on the Arts, for 1975 and 1982. He recently received a grant from the Lower Manhattan Cultural Council/Manhattan Community Arts Fund 2012.